Is It Dangerous to Paint During Pregnancy? If you’re decorating a nursery, you might be wondering whether painting while pregnant is safe. The less-than-satisfying answer? Probably. As of yet, there is no evidence of significant risk from exposure to unleaded, water-based paints. Studies evaluating the effects of paint fumes on unborn babies have found any risk to the fetus to be extremely low. That said, very little research has been done on the subject. Paint is chock-full of nasty chemicals, few of which have been tested for safety during pregnancy. While the individual effects of these chemicals on unborn children remains something of a mystery, studies have found that exposure to volatile organic compounds (VOCs) fume-emitting chemicals cause significant harm to humans outside of the womb. According to the Environmental Protection Agency, fumes from VOCs can result in anything from mild dizziness and nausea to damage of the liver, kidney and central nervous system. Suffer from asthma or allergies? The American College of Allergy, Asthma, and Immunology warns that exposure to VOCs can cause severe reactions, ranging from mild skin irritation to acute respiratory distress, in people prone to these conditions. Evidence also suggests that exposure to VOCs can weaken the immune system—a big negative for an already immune-compromised mama to be (ACAAI). Still Feel Like Cracking That Can Open? 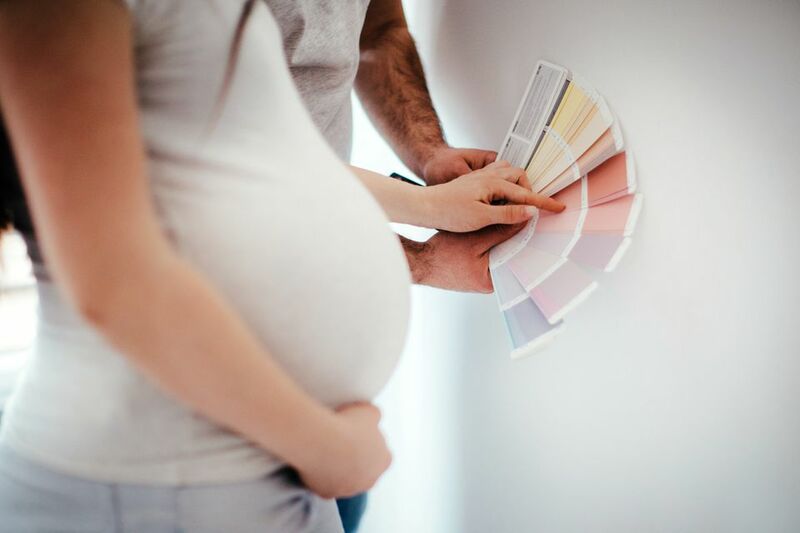 Even if you’re not concerned about paint fumes, there are plenty of other practical reasons to pass on painting the nursery while pregnant. Pregnant women are not exactly known for their agility. You could pull out your back, or even fall off a ladder or stool, injuring yourself and your baby. Could you paint the nursery yourself? Sure. Many have. But why take the risk? Assign painting duty to the hubby or recruit a good friend to wield a paintbrush on your behalf. It won’t be the last time you choose to err on the side of safety for the sake of your little one. If you must paint, don’t worry. It’s very unlikely that your temporary stint as a pregnant Picasso will cause your baby any harm. Just be sure to follow important safety rules and you should be fine.